Five mandatory topic credit hours for unrestricted, restricted and specialty license holders. One hour is required for each. We are a team of coordinators and offer the best training selection for contractors. Our goal is to make sure that in addition to receiving CEU's you also receive top notch training that you can utilize in your business right away. We have numerous locations where we offer trainings with our strategic partners. We are often asked by Lumberyards and Material Suppliers to conduct training for their contractor clients at their locations. We also train our programs throughout the Northeast. Private company trainings can be arranged at your desired location. We schedule the classes one or more months in advance and post them on this website and send announcements out to our strategic partners. Students can register online or by phone. Scheduled Classes: For unrestricted and restricted sign up for the full class. If you are a Specialty License holder and only need 6 credits (Roofer, Siding and Windows, Masonry, Insulation, Demolition, Burning Fuel sign up for one day. To register find your date and location on the brown tabs on the upper left. Who is affected and what do license holders need to do? 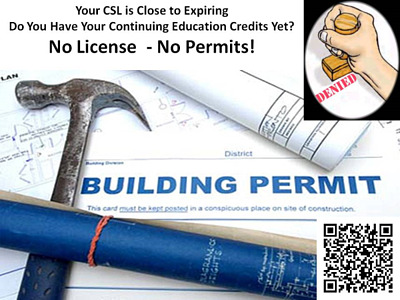 Massachusetts Construction Supervisor License holders are now required to earn Continuing Education Credits (CEU's) to renew their license. The Board of Building Regulations announced this program went into effect in July 2011. Licensees must provide proof of completion of the the required hours per license type for every two year license cycle. When do I need to obtain the required hours? Very important; there is confusion and mis-information regarding the timing and requirements of the CEU requirement. Some contractors have reported that they were coaxed to sign up for training prematurely. Some were not told that they had as much as three years to obtain their credit hours. Before you sign up for training make sure you are certain of your renewal date that requires credit hours. Some trainers are capitalizing on contractor ignorance and getting contractors to sign up earlier than neccessary without divulging all the facts. If your license renews 7/1/2013 or later you will need to provide proof of continuing education credit hours to renew your license at that time. The BBRS has announced that taking approved courses now (before your next renewal date) will count towards your required credit hours. How many credits and hours do I need to obtain? Depending on your license type you will need the minimum required topic credit hours and the balance to come from approved elective courses. Unrestricted; Construction Supervisor License; 12 credit hours, 7 required topic credit hours and 5 elective. Required topics; 4 hours code, 1 hour safety, 1 hour energy, 1 hour business and 5 elective. Restricted; One and Two Family License; 10 credit hours, 7 required topic credit hours and 3 elective. Required topics; Required topics; 4 hours code, 1 hour safety, 1 hour energy, 1 hour business and 3 elective. Specialty Licenses; 6 credit hours, 5 required topic credit hours and 1 elective. Required topics; 2 hours code, 1 hour safety, 1 hour business and 1 hour elective. How can I obtain my Mass approved CSL CEU training? To obtain your required credits licensees must take classes provided by coordinators and approved by the BBRS. The BBRS approves coordinators to deliver the appropriate training. The approved classes must impart appropriate and related knowledge in the regulated industries. The student must attend the class in its entirety in order to receive their credits. The Contractor Coaching Partnership, Inc. (#CSL-CD-0075) owned by Contractor Business Coach, Mark Paskell. Mark is a training instructor for many of the courses and is an OSHA ceritifed outreach trainer, EPA/RRP and Mass RRP approved instructor. Remodel My Business, Inc. (#CSL-CD-0078) Owned by Shawn McCadden. Shawn is a Remodeling Industry Expert, Educator, Trainer, Speaker and Contractor Business Coach.